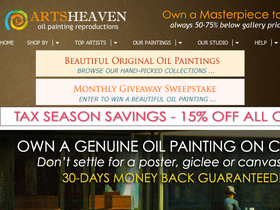 Arts Heaven, online at ArtsHeaven.com, is the destination for oil painting reproductions. Arts Heaven sells a variety of paintings in different styles including: unique aged and cracked oil paintings, Art Deco, Art Nouveau, American Landscape, Baroque, Classicism, Byzantine, Impressionism, High Renaissance, Contemporary Realism, Japanese Art, and Victorian. Arts Heaven also offers reproductions of work by famous artists including: Vincent Van Gogh, Claude Monet, Leonardo Da Vinci, Rembrandt, Edgar Degas, Paul Gauguin, Jan Vermeer, Edward Hopper, and Frida Kahlo. RetailSteal.com has the best Arts Heaven coupon codes, Arts Heaven discounts, Arts Heaven coupons, and Arts Heaven promo codes. Shipping and handling rates at Arts Heaven depend on the pricing of your purchase and your shipping destination. Free shipping is offered worldwide on all orders. See website for full details, exclusions may apply. Shop online at ArtsHeaven.com and enjoy a 25% discount on your order. Use coupon code on orders of $2500+ to qualify. Save 20% on any order of $1,500 or more using the exclusive coupon code when shopping online at ArtsHeaven.com. Click to save. Use this coupon code at Arts Heaven and enjoy 20% off all paintings. Save 15% on any order of $1,000 or more using the coupon code at ArtsHeaven.com. Click to shop. Get 10% off orders $500 or more using the coupon code while online at ArtsHeaven.com. Click to shop. Hurry over and check out Arts Heaven to save up to 75% on retail prices. Get 15% off all orders when signing up for the store newsletter at ArtsHeaven.com. Click to save. Get free shipping worldwide on all orders with no minimum purchase required at ArtsHeaven.com. Click to shop.